The portable crib safety guidelines on this page have been provided to give you peace of mind when you lay your little one down to sleep. Cribs that do not meet the standards for infant safety have been associated with strangulation, laceration, amputation, entrapment, suffocation, falling and SIDS. Not what you want for your precious newborn! Many portable crib accidents can be prevented by careful attention to detail during setup and use. 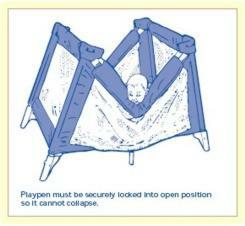 Improper setup can cause the baby bed to collapse resulting in injury or, heaven forbid, death to your baby. Make sure that the crib has top rails that will automatically lock when lifted into the normal use position. Wooden portable cribs or playpens should have slats spaced no more than 2 3/8 inches apart. A bigger gap than this can allow your baby's head to slip through, presenting a risk of strangulation. The top rail cover should have no tears or holes. Teething babies can swallow pieces of fabric and choke. Yep - unfortunately, the dangers are everywhere! Several brands of this type of baby crib have been recalled. See our small crib recalls report here. Never leave the drop-side of a mesh baby crib in the down position. This has resulted in deaths in the past. When a mesh side is left down, the mesh hangs loosely, forming a pocket between the edge of the floor panel and the side. Young infants even a few weeks old can move to the edge and fall into the loose mesh pocket where they can be trapped and suffocate. Even if your baby is not in the crib, the side should be left up as babies can try to crawl into the crib and cut or pinch their fingers on the unlocked hinge mechanism. Always set the crib up correctly. 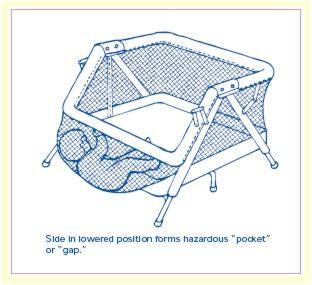 Improper setup can cause the crib to collapse resulting in injury or death to your baby. Make sure that all caregivers and babysitters know how to set up the crib. Stop using your portable crib, travel crib or playpen before your baby is able to release the locking devices and collapse it. Always send in the product registration card that comes with every new baby crib. By returning the card, you ensure you'll be notified if your crib is recalled. 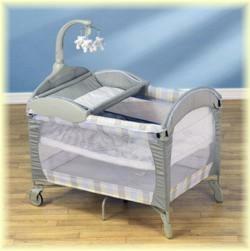 Check our small crib recall page for all the latest portable crib recalls news. In addition to checking your baby crib against the above standards for portable crib safety, look for a crib or playpen with JPMA certification. The Juvenile Products Manufacturers Association (JPMA) certifies baby cribs that meet, or exceed, voluntary safety standards issued by the American Society for Testing and Materials. These standards are stricter and safer than the mandatory baby crib safety standards promulgated by the Consumer Product Safety Commission (CPSC). Where the crib is placed in the baby nursery room. The temperature of the baby nursery. How you put your baby down to sleep. All of these infant safety factors are important for the well-being of your baby, but there are far too many to list them all here. The best way to make sure you have everything covered is to use a nursery safety checklist when you are setting up your baby nursery. I urge you to take baby nursery and crib safety seriously and give your delicate, little newborn the environment she deserves so that she can sleep safely. There are far more baby nursery safety issues than those covered above. 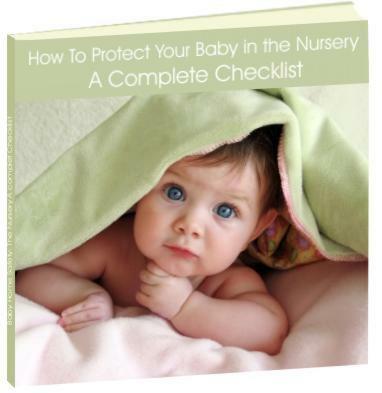 The best way to make sure you have everything covered is to use a nursery safety checklist when you are setting up your nursery. The above baby crib safety standards are presented by Creative Baby Nursery Rooms for the purpose of educating mothers about baby crib safety issues. This information is accurate to the best of our knowledge but we make no guarantees in this regard. We believe that the standards for infant safety in the crib provided on this site can help prevent baby crib accidents, however, an infant's safety is the responsibility of its caregiver alone. Creative Baby Nursery Rooms accepts no responsibility for any baby crib accident, which may occur as a result of any information on this site.